Alexandra participated in this year's Ecco Walkathon with Felix, and as a surprise Nikolai joined as well. Together with about 14,000 other go-happy people, the three-leaf-clover went in fine weather for the good purpose, SOS Children's Villages and Heart Association. - "Lots of good food!" In the barracks the menu is mostly on potatoes and brown sauce. - "But it is also fine", insured the 19-year-old prince. Countess Alexandra also enjoyed having both of her sons on the walk for Ecco Walkathon, which the she has supported for many years. - "It's really nice", said a happy Alexandra, looking lovingly at his two beautiful sons. - "They're getting taller and taller", said the countess with a warm smile. What a lovely photo! They look so happy! I'm glad to see she's still involved in this patronage. She's been a good patron for them, and she almost always takes the boys with her. Alexandra has published a book - "My happy country" - where she writes about what makes you happy. This is connected to Denmark having been the happiest country in the worlds several times and about how her experience has been living here. It sounds quite interesting. Countess Alexandra's new book, "My Happy Country", will be released tomorrow, October 2. Monday afternoon there was a reception for the Countess family and friends at Designmuseum Denmark in Copenhagen, where more than 100 good friends joined the author. 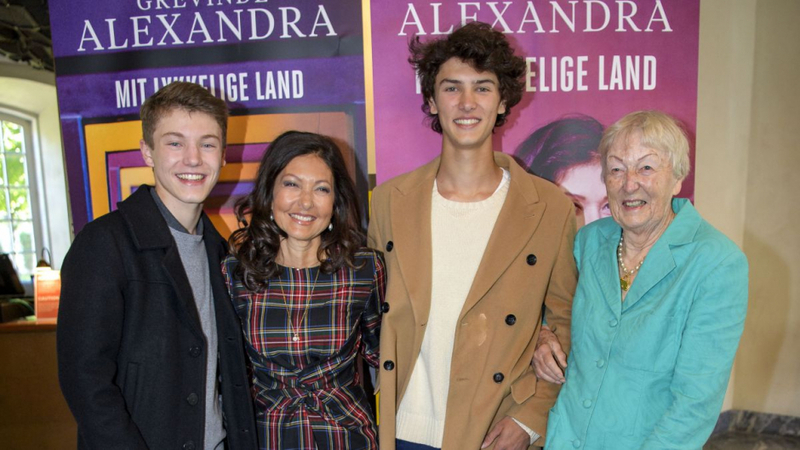 But those who meant most to her, the two sons of Count Alexandra, Prince Felix and Prince Nikolai, as well as her 85-year-old mother, Christa Manley, who lives in Austria, joined the reception before the book is released. - "No, I'm not nervous, but I'm very excited", said Countess Alexandra, who arrived in on time with her co-author, Rikke Hyldgaard. - "And I'm very happy. There have not been any reviews yet, but from those who have read the book, I have received a very good response, and I'm excited", the Countess, who shone in the plaid dress in front of a couple of big posters of herself. Alexandra set herself to investigate because, despite her birth and upbringing in the city of million, Hong Kong, she feels more Danish than anything else. Good to see her mother still looking well. N&F really are two handsome young men.. They are. And I can see a strong resemblance between Alex and her mother. alex's face looks really puffy. is it too much botox folks who know these things, please? Am I the only one who remains kind of confused as to why Alex and Joaquim split up? It never made sense to me. we'll never find out really, and that's good so, it's their private thing. Since they get on so well, I don’t think it matters much. I think they simply grew apart. I personally think it was not something major. I think they were very different people who just grew apart. It was a bit of a rushed engagement and it just did not work out. They stayed exeptionallly friendly with each other and they are a great example for patchwork families.